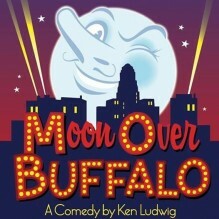 Moon Over Buffalo centers on George and Charlotte Hay, fading stars of the 1950’s. At the moment, they’re playing in Buffalo, New York with 5 actors. On the brink of a disastrous split-up, they receive word that they might just have one last shot at stardom: Frank Capra is coming to town, and if likes what he sees, he might cast them in his movie remake of The Scarlet Pimpernel. Unfortunately for George and Charlotte, everything that could go wrong does go wrong hilarious results.